December 18, 2009 - The city of Lisbon will make its debut on the Red Bull Air Race calendar in 2010 when the World Championship makes a highly anticipated return to Portugal. “We were keen to keep Portugal on the calendar and Lisbon was able to fulfil all the requirements needed to host a race and take the Red Bull Air Race World Championship to the next level. We are looking forward to the partnership with Portugal’s capital city and racing in a new and spectacular location,” said Bernd Loidl, CEO of Red Bull Air Race. “Portugal has proved to be a popular fixture on the race calendar with cities of Porto and Gaia providing an incredible venue for the Red Bull Air Race for the last three years, attracting record crowd numbers. Both cities have played a critical role in the growth and development of the sport,” Loidl said. Moving into its sixth season, The Red Bull Air Race World Championship has experienced record growth as a global sport. In 2009, 3.5 million spectators attended the races and over 300 million followed on television broadcasts around the globe. This growth has attracted the attention of many major cities around the world due to the positive impact the race has on community and most importantly, a proven track record to for delivering strong economic returns for the host city. The Red Bull Air Race, established in 2003 and created by Red Bull, is an international series of air races in which competitors have to navigate a challenging obstacle course in the fastest time. Pilots fly individually against the clock and have to complete tight turns through a slalom course consisting of pylons, known as "Air Gates". The races are held mainly over water near cities, but are also held at airfields or natural wonders. They are accompanied by a supporting program of show flights. Races are usually flown on weekends with the first day for qualification then knockout finals the day after. The events attract large crowds and are broadcast, both live and taped, in many nations. At each venue, the top nine places earn World Championship points. The air racer with the most points at the end of the Championship becomes Red Bull Air Race World Champion. The 2005, 2006, 2007, 2008 and 2009 series were won respectively by the pilots Mike Mangold, Kirby Chambliss, Mangold, Hannes Arch and Paul Bonhomme. Four new pilots from four countries joined the Red Bull Air Race World Championship in 2009: Canada’s Pete McLeod, Japan’s Yoshihide Muroya, Australia’s Matt Hall and Germany’s Matthias Dolderer. The Red Bull Air Race was conceived in 2001 in the Red Bull sports think-tank which has been responsible for creating a wide range of innovative sports events across the world. The aim was to develop a brand new aviation race that would challenge the ability of the world’s best pilots, creating a race in the sky that was not simply about speed, but also precision and skill. The answer was to build a specially designed obstacle course which the pilots would navigate at high speeds. Development of the prototypes of what are now known as the ‘Air Gates’ began in 2002 and renowned Hungarian pilot Péter Besenyei successfully completed the first test flight through them. After two years in planning and development, the first official Red Bull Air Race was ready to take off in Zeltweg, Austria in 2003. A second was staged the same year near Budapest in Hungary. In 2004 three races took place in Kemble (England), Budapest (Hungary) and Reno (USA). The series was expanded in 2005 to become the Red Bull Air Race World Series. Ten pilots competed in seven races around the world – Mike Mangold was crowned the champion with Peter Besenyei and Kirby Chambliss in second and third place respectively. Eight races took place in 2006 with 11 pilots competing. Kirby Chambliss was crowned the champion for the Series' second season. In 2007 the calendar was extended to include ten races with the first race on South American soil taking place in Rio de Janeiro. 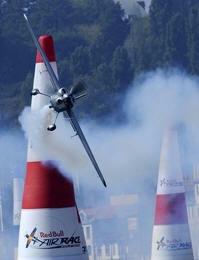 Mike Mangold reclaimed the title of Red Bull Air Race World Champion 2007. 12 pilots took part in 2008 in eight races around the globe and Austrian pilot Hannes Arch became the first European to win the championship. The largest number of pilots so far took part in six races in 2009. 15 pilots from 12 different countries competed for the world championship title, this time with Brit Paul Bonhomme coming out on top, after coming so close the previous two years.